Herein will be found pictures of varied and assorted miniatures for gaming Victorian Horror (Rippers, etc) as well as Victorian Science Fiction, and some straight-up historical colonial armies. 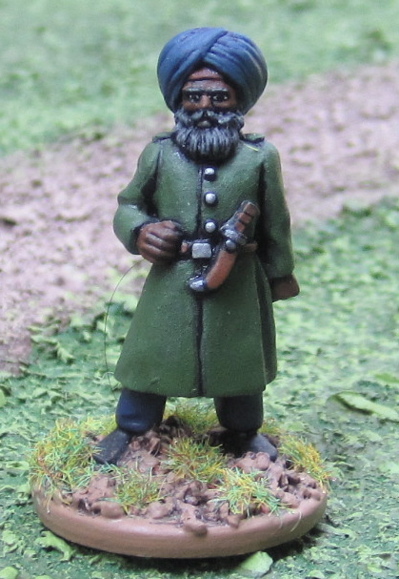 British General - the model is supposed to be Lord Chelmsford (Zulu War) but I figure could be passed off as other Generals - Redoubt Enterprises. 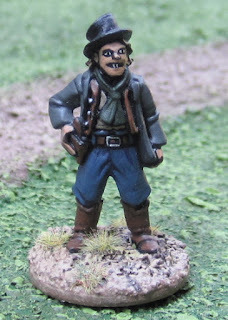 A unit of British Infantry from Black Tree Design. 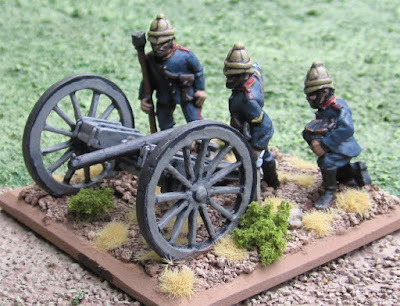 As these were painted for the Zulu War and have blue cuff and collar facings, I was probably imagining them to be 1st Battalion, 13th (Somerset) (Prince Albert's Light Infantry) Regiment of Foot. 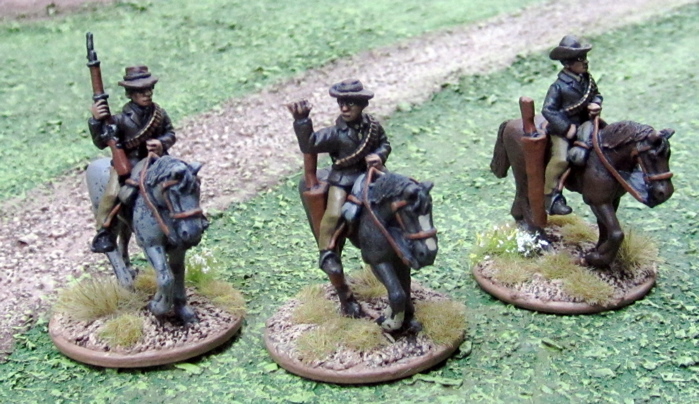 A unit of British Infantry from Old Glory. 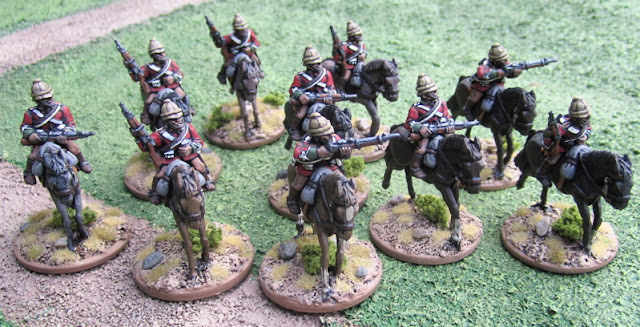 These would be the 3rd Battalion, 60th Rifles in the Zulu War. A unit of British Infantry from Wargames Foundry. These would be the 99th (Lankarshire) Regiment of Foot in the Zulu War (yellow cuff and collar facings). 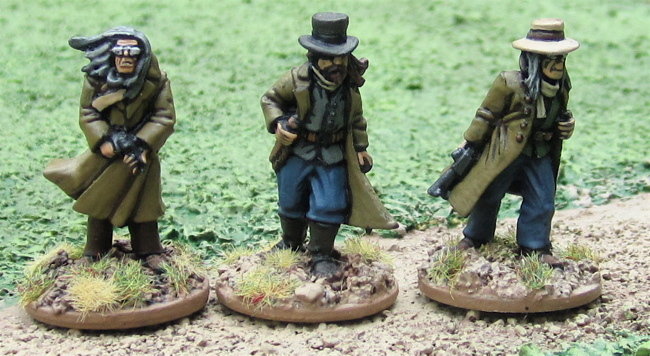 A unit of British Highlanders - I forget what unit I was trying to do... 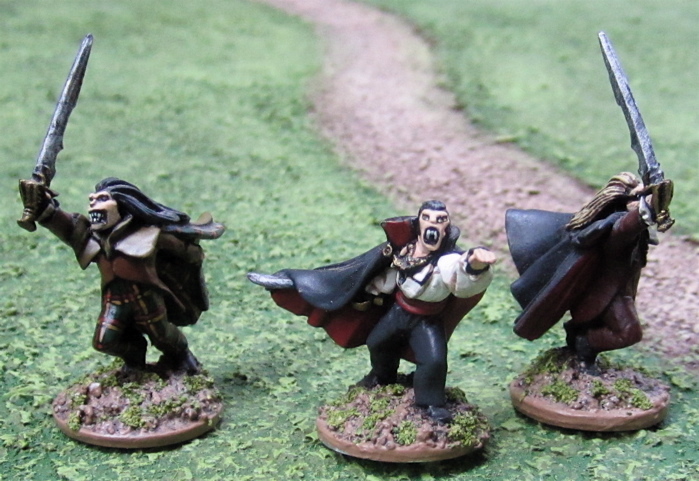 The bulk of the unit are homemade figures that my friend John made (and I painted). The Officer and Piper are from Minifigs. 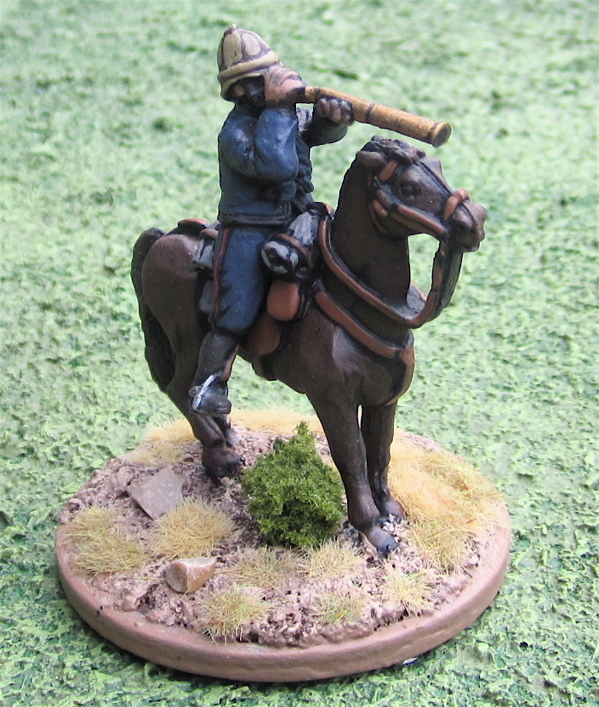 British Mounted Infantry from Black Tree Design. 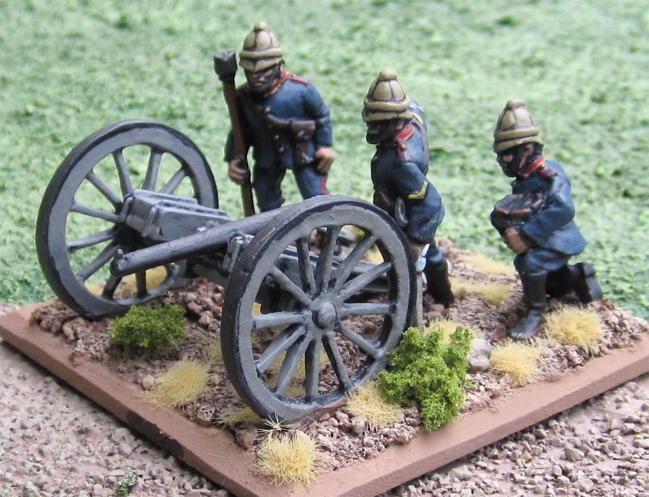 These were troops raised from the regular infantry battalions in South Africa at the time of the Zulu War. Looks like they all have the green facings of the 24th - perhaps I should have done a mix of different coloured facing as the unit was a composite. British Gatling Gun team - from Black Tree Design. 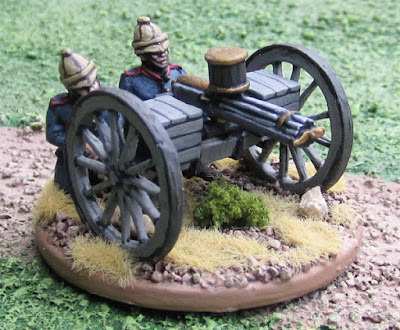 British Artillery - from Black Tree Design. 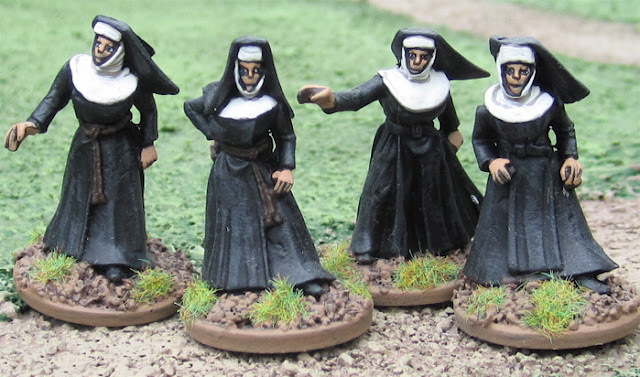 This is a small force of figures most of which I painted almost 30 years ago. They are currently organized for The Men Who Would Be Kings. These are actually the same Highlanders pictures above in the British Infantry section. 2nd Battalion Queen’s Own Martian Rifles (the Parhoon Rifles). 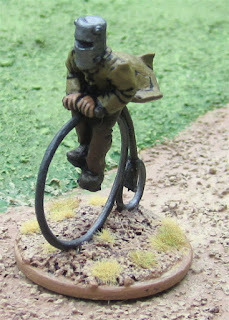 The Martians are all from RAFM, their British officer is from Black Tree Design. 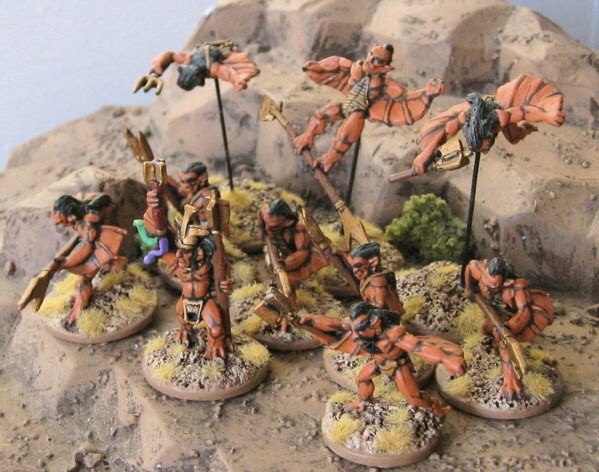 1st battalion, 4th Martian Infantry Regiment. Again the British officer is from Black Tree Design and the Martian infantry are from RAFM. 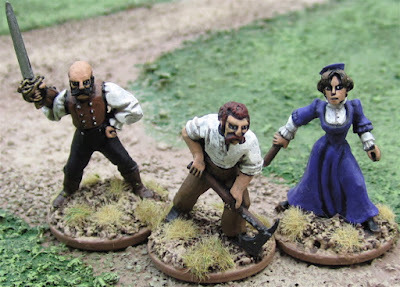 Boers for fighting British in South Africa - they could also be pressed into service as armed settlers or colonial civilians in other locations...? Mounted Boers from Black Tree Design. Boer Infantry from Black Tree Design. Unmarried Zulu Unit #1 - figures from Black Tree Design. 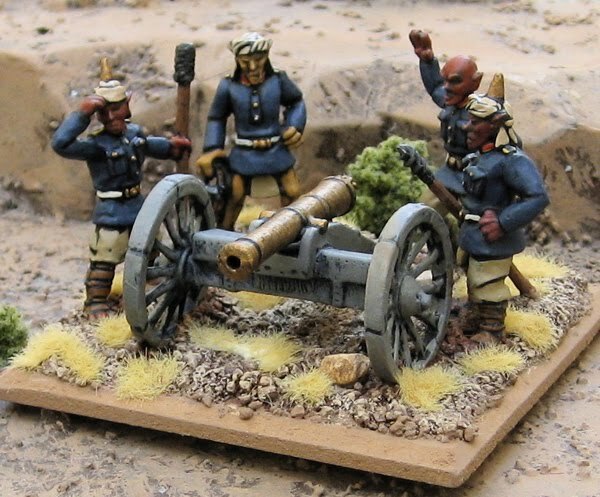 Unmarried Zulu Unit #2 - figures from Black Tree Design. 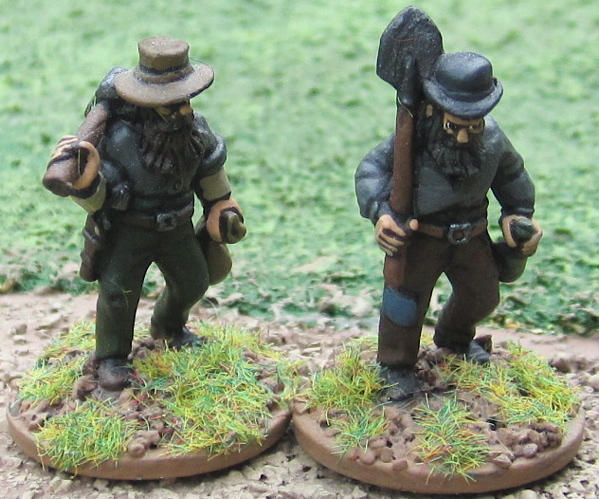 Unmarried Zulu Unit #3 - figures from Wargames Foundry. 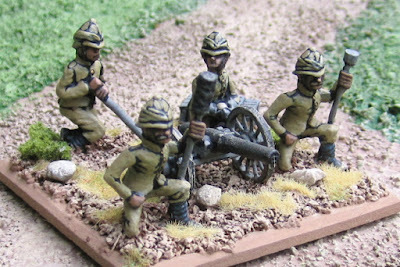 Unmarried Zulu Unit #4 - figures from Wargames Foundry. 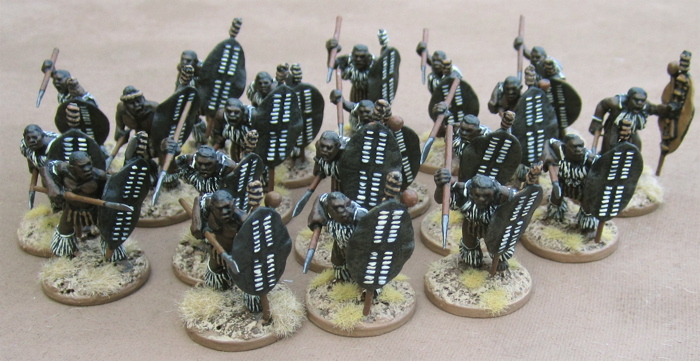 I have enough figures for 3 more units of 20 - and if I bought two more packs of BTD Zulus I could put together a fourth. 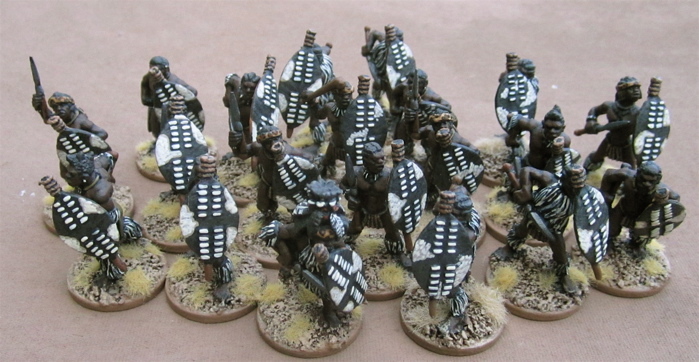 But I should probably get to assembling and painting some of the MARRIED Zulu units first. 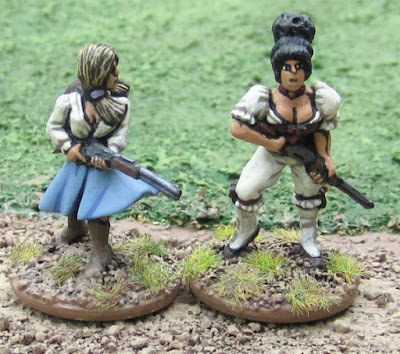 Zulus with firearms - a mash-up of married and unmarried zulus with firearms - figures from Wargames Foundry. Zulus with pilfered British Equipment - which I could mix into any of the above units for a bit of flavour post-Isandlawana - figures from Wargames Foundry. 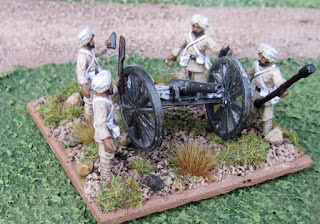 These are meant to be opposing forces for the colonial forces. 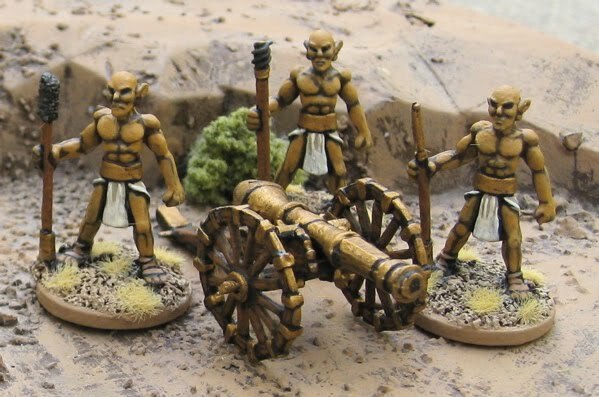 They could be from the Oenotiran Empire or any other Canal Martian enclave that resists Imperialist Invaders from Earth! High Martians are from RAFM. A great many of these are from West Wind Productions Vampire Wars line - which I originally picked up to play Rippers: The Horror Wars. 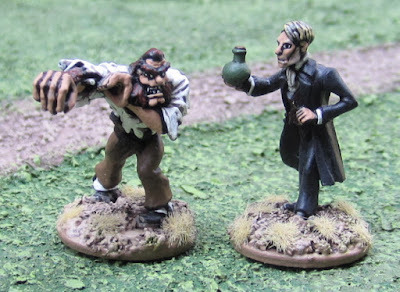 In addition to Victorian Horror skirmish and role-playing games, I have used this in Victorian Science Fiction skirmish and role-playing games (like Space: 1889) and even in straight up historical skirmish adventures. Many I've also used right up into the 20th Century in 1920's/1930's Pulp Adventure games. Mr. Sherlock Holmes, Consulting Detective, and his flatmate and partner Dr. John Waston - West Wind Productions. 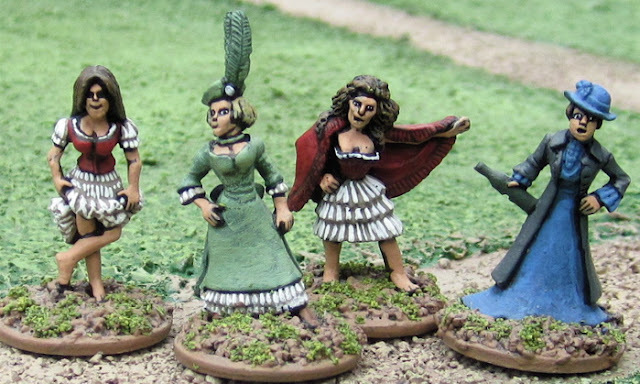 Gypsies from West Wind Productions. 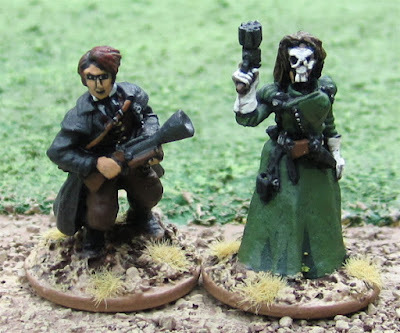 Jonathan and Wilhelmina Harker - West Wind Productions - yeah... I have no idea what's up with the skull mask thing...? Two player character figures from an old Rippers game. 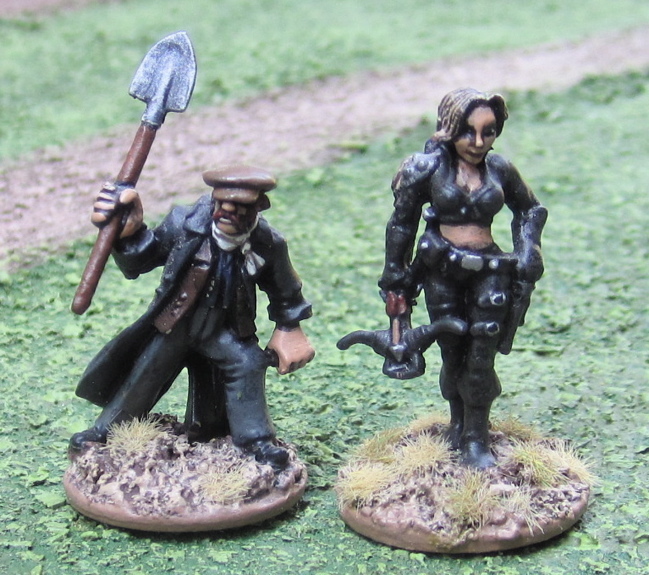 Cutis' character (on the left, I forget the character's name) was a grave digger. 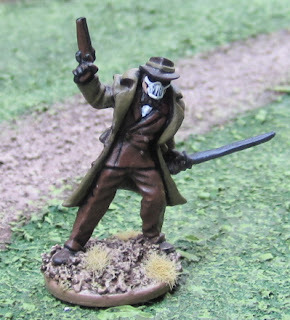 The figure was one of the London Mob figures from West Wind Productions - I drilled out his fist and added the shovel (which I, I think was from Reaper Miniatures...?). Amanda's character (on the right, whose name I also forget!?) was a vampire hunter. 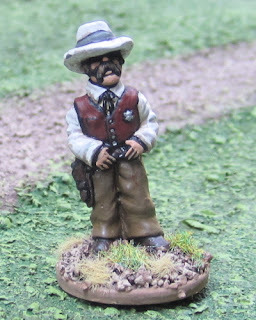 Jack the Ripper from West Wind Productions - again with the skull masks...? Vampires from West Wind Productions - the chap on the left I've done in tartan trews and a tartan lined cloak and I think I'd named him Byron McDaid... He was to be recurring villain in a campaign story arc that never really came to fruition. Ghostly Apparition (or a vampire in an etherial form...?) 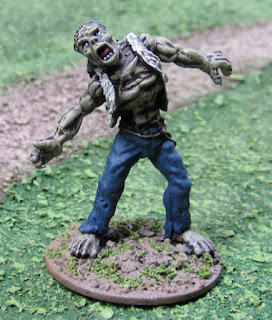 - the figure is another Vampire from West Wind Productions. Another earlier Flesh Golem/Dr. 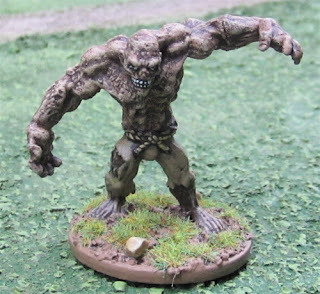 Frankenstien's Monster - also from Reaper Miniatures...? 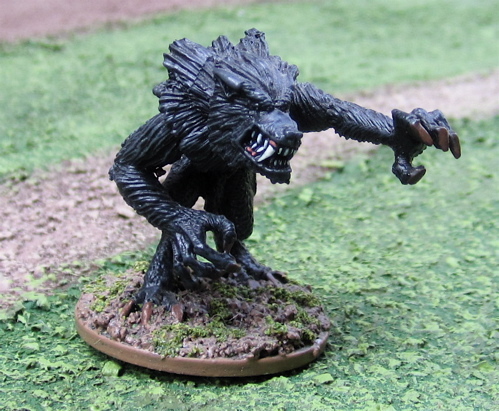 Greater Werewolf from West Wind Productions. William H. Bonney (Billy the Kid) - I think this was a special freebie miniature that came with Legends of the Old West...? I have more... Some I just need time to take pictures of them. 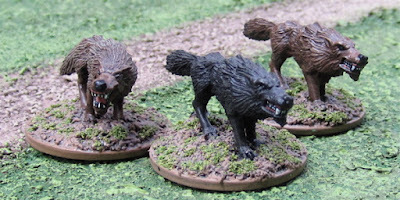 Others I just need time to paint them and then take pictures of them!? I know I've added Zulus in the last year and most of the pictures above have been posted in the last 3.5 years. I think the only pictures I had posted 3.5 years ago when Paul commented were some of the Martians. 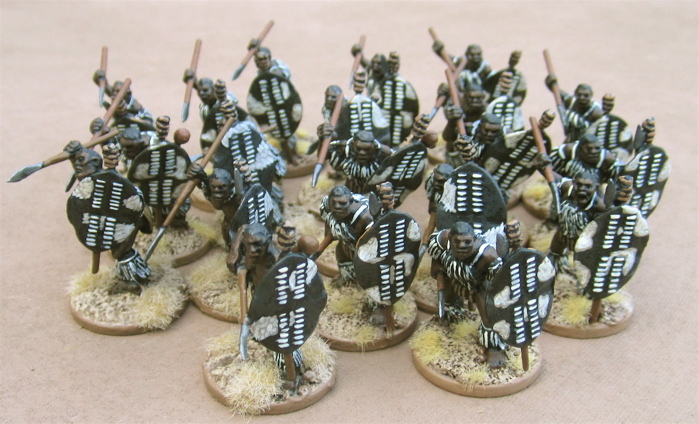 I do hope to work on some more Zulus in the not-too-distant future as I'd like to try out Men Who Would Be Kings. I also have a lot more Martians and British to paint at some point. And some American Marine and Army infantry and German Seebattalion. With the smattering of colonial powers and piles of Martians I though at some point I might do a "55 days at Oenotiria" game! Of course I have a LOT of other stuff I want to paint so it could be a while before I get to them. It just occurred to me that I do have a bunch of French Foreign Legionnaires that could go in this gallery. Your work is amazing! I hope to approach your level of quality in time. 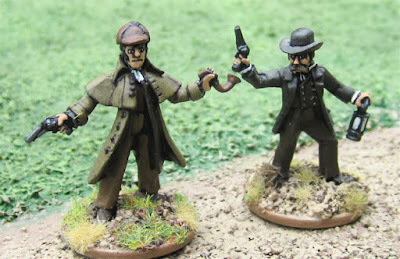 I'm currently developing a League of Extraordinary Gentlemen scenario and would like to use the Scotland Yard minis that you have on this page. I'm having trouble finding those specific minis, though. 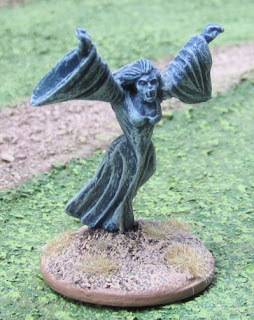 Could you tell me the product name or provide a link to them? Thanks in advance for anything you can offer. 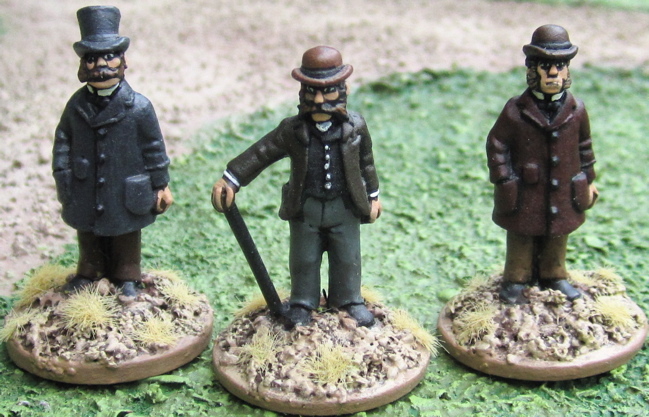 Or the Victorian/Edwardian collection from the Foundry.